Tampa’s Sunset Music Festival is known for its diverse lineups over the years. With The Chainsmokers, Hardwell, Marshmello and Excision headlining previous years, SMF always draws a crowd. But something stands out in this years announcement. Instead of highlighting a few headliners, the first round lineup for SMF 2019 is being announced in alphabetical order. And the 28-name roster is quite impressive. While most of the previous SMF lineups have had a heavy EDM/Bass music profile, this year seems to be all about house music. Fisher and Kaskade are the two highest profile names in house but acts like Walker & Royce, Destructo and Chris Lake appear on the list as well. And who could forget the infamous Dog Blood? Skrillex and Boys Noize‘s collaborative project is making a comeback this year with a stop in Tampa. But that doesn’t mean the festival is exclusively house music. 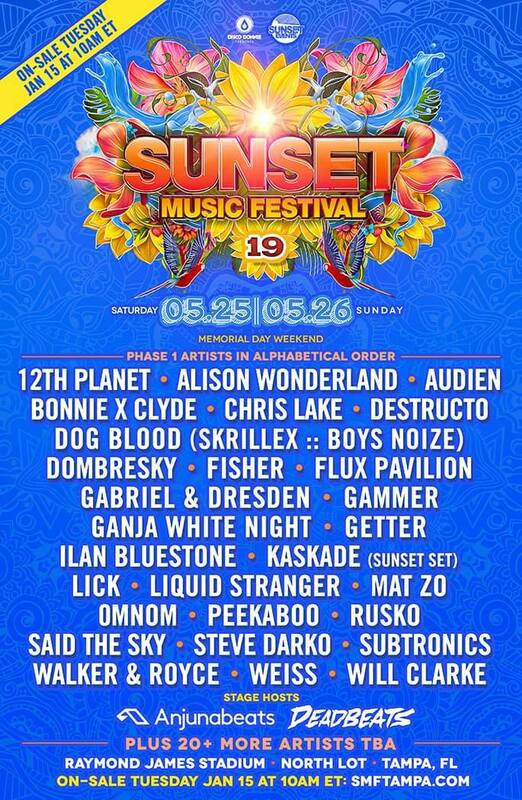 12th Planet, Alison Wonderland and Peekaboo will be there to melt your face with bass. There’s also a Deadbeats stage takeover as well as a curated lineup by Trance label Anjunabeats. So get your wallets ready because tickets go on sale tomorrow, January 15th! You can find the full lineup on the poster below. We’ll see you on the dancefloor!